After your graduation from the degree programme Bachelor of Science Tourism you are entitled to the degree Bachelor of Science, You can decide whether to find a job in the (sustainable) tourism industry as strategic policy advisor, consultant or researcher, or continue on a master's programme such as one of the master's programmes at Wageningen University. Learn more. After your bachelor. 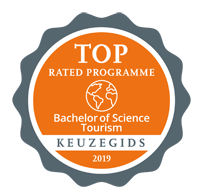 The Bachelor of Science Tourism is a three-year joint degree programme delivered by staff from both Breda University of Applied Sciences and Wageningen University. Year 1 and 2 take place in Breda. In the first year you explore the complex and multifaceted tourism phenomenon from different angles. In the second year you deepen your knowledge of sustainable tourism development. This year includes an international field project in Southeast Asia. The third year takes place in Wageningen and consists of a minor of your own choice and your bachelor's thesis. During your studies you will move towards increased (educational) independence. This means educational guidance is at its height during the first year and gradually decreases over the next two years. Breda University of Applied Sciences also offers an English-taught professional bachelor's programme Tourism Management, and two Dutch-taught programmes, one of which leads to an Associate Degree. Finally Breda University of Applied Sciences offers a master's programme in the field of tourism. You get introduced to the social, economic and environmental sciences and their contribution to tourism. Through disciplinary courses you get an overview of concepts, theories and their application in sustainable tourism. The main teaching methods used are lectures, tutorials and field assignments. You will deepen your knowledge of tourism development, policy, governance and law, organisational behaviour and business management. You also expand your academic skills and study philosophy of science. In the interdisciplinary courses in the fourth semester you will explore directions for sustainable tourism development. This year includes a four-week international research project. In the first semester you choose a minor - this may be towards your master’s degree or pursuing your personal area of interest. You can - for instance - choose a minor in international development studies, management studies or environmental sciences. You can also choose to do your minor at another university in the Netherlands, or abroad. In the final semester you will gain an insight into the principles of entrepreneurship and the latest innovations in policy, technology and sustainability. You finish your major with a bachelor’s thesis. In general, the difference between academic and professional programmes lies in course content, teaching methods, independence, freedom of choice, course transferability, and graduation perspectives. Similarities can be found in terms of educational philosophy and mindset.